The statue of Rajasthani man & the made of wood & hand painting. It, s look very old pieces. 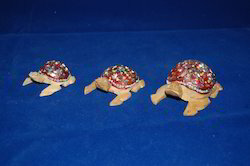 Fine Meena Decorative Tortoise Available In Different Designs & Sizes. This Musician Set is made by the hands of expert artisans and is an exclusive item for gift as well as home decor purposes.It is appreciated all around the world. Enriched with vast industrial experience, we offer an extensive range of Tiam Platter. We are the leading Manufacture supplier of Decorative Supari Dhan and offer this product as per client requirements and this product Made by our expert with Good quality and we are looking for bulk order.